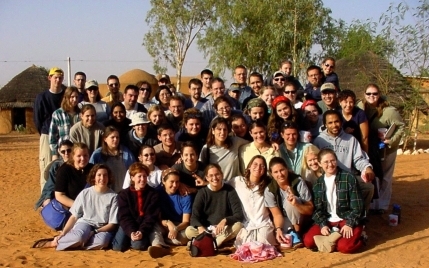 Because of the war in Iraq, the worldwide terrorism alert, and generally heightened global tensions and anti-Americanism, I thought it would be useful for you to have a report on the current situation in Niger, especially as it relates to Peace Corps Volunteers, directly from me. Also, I ask that you not call or email me directly with questions. This is because I need to focus all my attention on supporting the Volunteers and staff, and moreover I am often out of the office visiting Volunteers in the field or attending meetings. For specific problems or inquiries, you should call the Peace Corps Office of Special Services (800-424-8580 ext. 1470, or 202-638-2574 after business hours). If they can't answer your question in Washington, they will relay it to me or a member of my staff. The situation in Niger is calm. In fact, if we didn't listen to radio/TV, we wouldn't know anything unusual is happening in the world. Shops, markets and government offices -- including the US Embassy -- are open, and people are going about their normal activities. Last Sunday, March 16, there was an anti-war demonstration in Niamey by about 650 people; but it was peaceful and well controlled by the Government. There have been no further public protests and no anti-American incidents. The Government of Niger has been very responsive to our security concerns and pro-active in trying to meet its responsibilities for the security of Americans, specifically including PCVs. As a precautionary measure, police have been posted at some of our regional hostels, and gendarmes have visited some Volunteer villages to check on security. We remain in contact with Nigerien security officials as well as with the US Embassy on a daily basis. To help us keep in touch with what's going on outside of Niamey, we have sent senior Nigerien staff members to the regional offices in the east, where they are in close contact with the local authorities as well as with the Volunteers. During the weeks leading up to the war, I told the PCVs about what was going on in a series of alert messages, and asked them to keep us fully informed of their whereabouts at all times, to remain especially alert and report any signs of danger, and to keep a low profile. I also told them to stay in their villages (where they are as safe as they could be anywhere), and that they should not congregate in groups of more than six (so as to maintain a low profile and not present a potential target for terrorists). When the war began, on March 20, we implemented the "standfast" phase of our Emergency Action Plan. This requires the Volunteers to stay at their posts, or wherever they are when they receive the standfast message, to await further instructions. As we told them in the message, we do NOT see this as a prelude to an evacuation, but rather as a precautionary measure to keep them in place and readily accessible while we assess the local repercussions of the onset of war in Iraq. It is my intent to review the situation Monday, March 24, and if there are no threats or incidents, to lift the "standfast" and return to cautious activities as normal. Currently, I am satisfied that the Volunteers are as safe as any Americans can be under present global circumstances. This assessment could of course change quickly, depending on what happens here and elsewhere in the world. I am fully aware that neither Niger nor Peace Corps is immune to terrorism and other hostile acts. However, I am optimistic -- more than I was a couple of weeks ago -- that we will be able to weather the current crisis without major problems in Niger. Finally, I want to assure you that the safety and security of the Volunteers is the very highest priority for my staff and me, and we are fully focused on meeting our responsibilities in this regard. If the situation changes and the Volunteers appear to be in danger, I will not hesitate to evacuate them to safety. I greatly appreciate your support for your Volunteer family member or friend in Peace Corps/Niger. You should be extraordinarily proud of them and the outstanding work they do. J. R. Bullington is a retired Foreign Service officer and U.S. ambassador with service in Vietnam, Thailand, Burma, Chad, Benin and Burundi, as well as the Department of State. He became Peace Corps country director in Niger in August 2000. He is author of two pieces that have previously appeared in Peace Corps Online - "Return of the aged hippies" and "Return of the aged warrior?". I hope you have volunteers paired together in most sites. If you don't, as you probably don't because that is not Peace Corps policy. I hope you will do everything you can for the "stronger volunteers" who serve on their own. Making sure they are living with someone responsible in that particular village. I also hope you will get a chance to get away from the air conditioning and visit these particular "volunteers". Being a State Department Official and Ambassador in Chad, you must have seen this type anti-american attitude during every dry season. I worked with Dr. Alfred Buck on a Chad project and we would run into all kinds of security issues during that time, let alone today's security concerns. I wish you the best in leading these "volunteers". They are our best and I hope you treat them that way. God Bless and thanks for your message.